DARIEN — There is a neighborhood in an in-town Darien location that successfully integrates the close-knit feel of 1950s America with the lifestyle of the new millennium. Neighbors on this family-friendly street know each other and they hold block parties. Children safely ride their bicycles and play on the street because it is not well traveled. Only those who live there usually drive down Bailey Avenue. 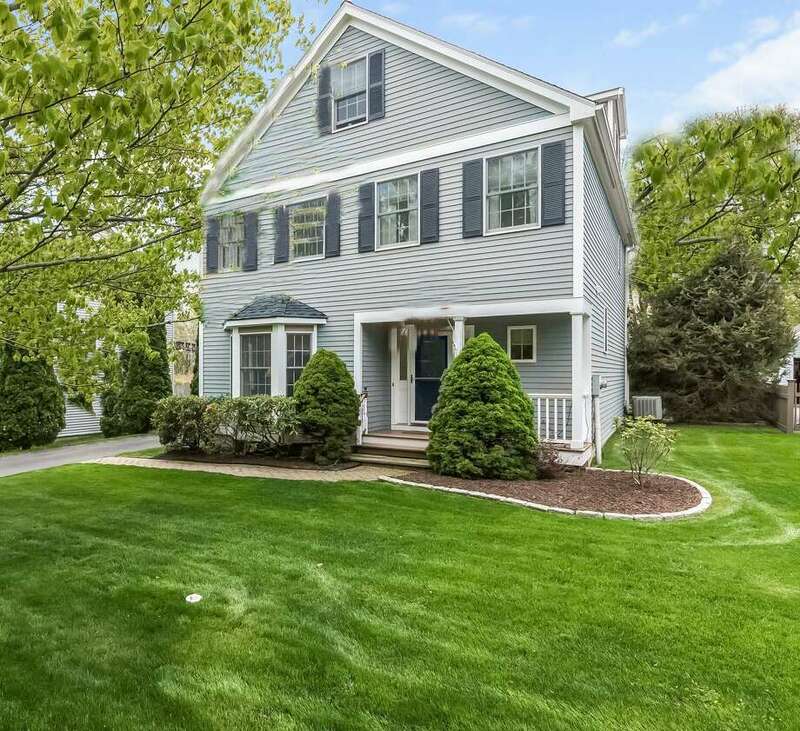 At 19 Bailey Ave. there is a colonial house on the market that would be ideal for a family that appreciates a melding of a mid-20th century sensibility with the amenities of the 21st century including a 10-room home with an open floor plan and convenience to town features. “Living on Bailey Avenue for the past 20 years has been a wonderful experience for our family … Bailey Avenue has the most amazing neighbors. We have an annual block party every summer and random get-togethers when the weather is warm. One of the most comforting things I’ve treasured living here is the dependability of my neighbors … We always had/have each other’s back. As a mom, this is a priceless quality to have,” said Linda Stephens, one of the homeowner, who is relocating within Darien. This house is within very easy walking distance to the Metro North train station, making it perfect for commuters. In fact, this house is so convenient to downtown shops, restaurants, Tilley Pond Park, and Whole Foods, that the owners would not need to have a vehicle in the driveway. But if they did have a car they should also know that this house is close to the Post Road (Route 1) and I-95, and only a short distance from the Merritt Parkway. “Being able to walk to the train and spend the day in New York is easy and stress free. Both Bryan and I worked in the city when we moved here originally. It was one reason we purchased the home because of the convenience of walking to the train,” Stephens said. “Now that my children are older they can walk to town to get food, ice cream, go to the movies or meet friends. It’s comforting to know that they are safe to explore Darien on their own while being close to home,” she said. “Enjoy a spacious home, quiet street, and convenience all in one,” the realtor said. This beige house with burgundy shutters and white trim was built in 1996 and it has 2,906 square feet of living space on four finished floors, and it is an amazing value for Darien. The house sits on a level property of almost a quarter of an acre. While the houses are closer together in this neighborhood this property does enjoy privacy because of its fencing and shrubbery. A paving stone path leads to the covered front porch and the front door and sidelights, both of which have attractive leaded glass windows. The door opens into the foyer, which reveals the open floor plan. While there is an easy and open flow there are defined rooms. From the foyer there is a long hallway, which provides access to the formal living room, formal dining room, family room, and kitchen. The foyer also has a powder room. The living room has a bay window. The dining room has chair railing and wainscoting on the lower walls. In the family room there is a red brick fireplace with a raised hearth, ceiling fan, and sliding doors to the paving stone patio and large flat grassy backyard. The family room is open to the kitchen, which has a hardwood floor, and white cabinetry. One area of the counter space doubles as a breakfast bar. On the second floor there are three bedrooms. The master suite has its own bath and the other two bedrooms share a hall bath. The fourth bedroom is found on the third floor. It is en suite. This level has a second room, which can be used as an office or an exercise room. This whole floor could also serve as an au pair suite. The finished lower level also has flexible use as a media room, play room or game room. “I hope you love looking at our home. It’s been filled with love and laughter over the years,” Stephens said. For more information or to make an appointment to see the house contact Elaine Falkenberg of William Raveis Real Estate at 917-941-5362 or elaine.falkenberg@raveis.com.